Some Brilliant shots, some good deliveries, 2 centuries, verbal arguments...Day 3 of 3rd Test between Australia & India had it all. The hosts went on to make 530 in their 1st innings on Day 1 & almost Day 2 which is indeed a great score. 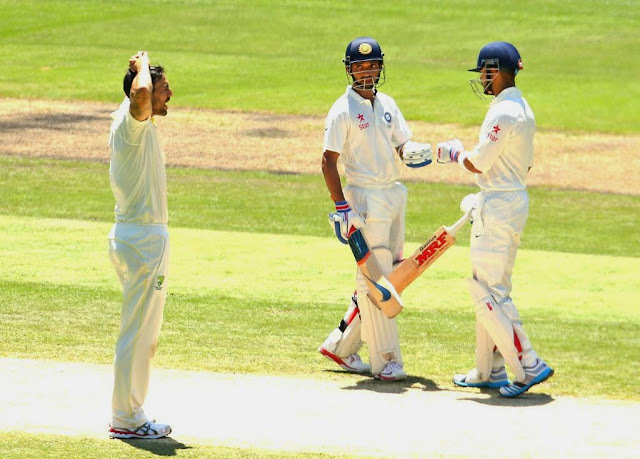 India's batting proved no less & the team ended the Day 3 trailing by 68 runs. In the Indian innings what came across as the best part was Virat & Rahane's colossal 262 run partnership which is the highest outside the continent in the last 10 years, while Ajinkya Rahane scored a magnificent 147, missing his 150 by a whisker, Virat Kohli completed his 150 & at the end departed on 169. Rahane's innings was smooth & had some wonderful shots in it. 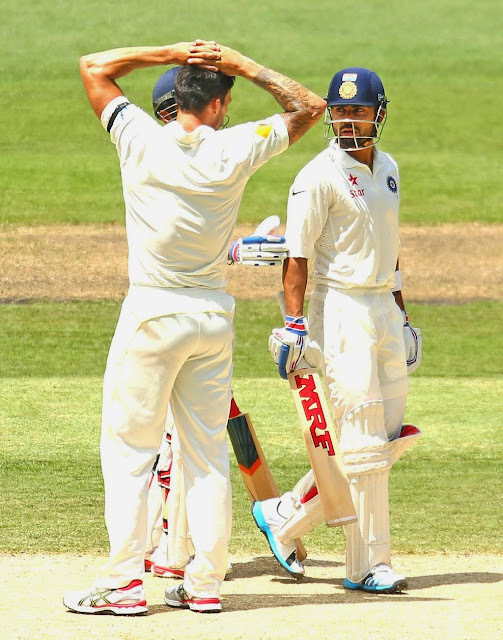 What came as a rough part in the latter's innings was his verbal fight with the Australian pacer Mitchell Johnson. Kohli had been struck by Johnson who was trying to hit the stumps. The right handed bastman did not take this lightly and was spotted quite a few times being involved in the spat with Johnson. Later at a press conference after the match when asked that does he respect the Aussie players, Virat went on to say - "I respect a few of them. I have no reason to respect anyone who doesn't respect me. I am not here to gain respect, I am out there to play Cricket". He said some things in the conference which were really supported by the Indian fans, one of them being- "They called me a spoilt brat and I said maybe that's what I am. It seems to be working in my favour and they don't seem to be learning their lessons. " Well, the tours & matches involving India & Australia can never be complete without some clashes & verbal spats between the players but amidst these spats what matters is Cricket, afterall they all are out there to play the game & all the aggression comes from the sport itself.